Namja Town is home to, most importantly, Gyoza Staduim, but they also do anime collabs too. This time I went to the Yuri!!! on ICE collaboration event. There's so much food for this event, I'll probably end up going multiple times in order to try everything. Luckily, it lasts until May 7th. 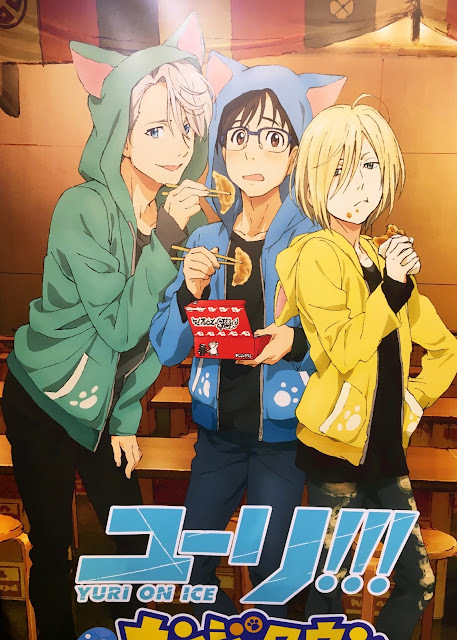 The official artwork for this event is just too cute. God bless. So the website claims that this event has been running since January, but all of the food and merch have only been there since the beginning of March. For the first two weeks, you have to buy a special limited ticket in advance to have access to the food and the goods, I was fortunate enough that I managed to grab a couple for the last day of the limited ticket period. 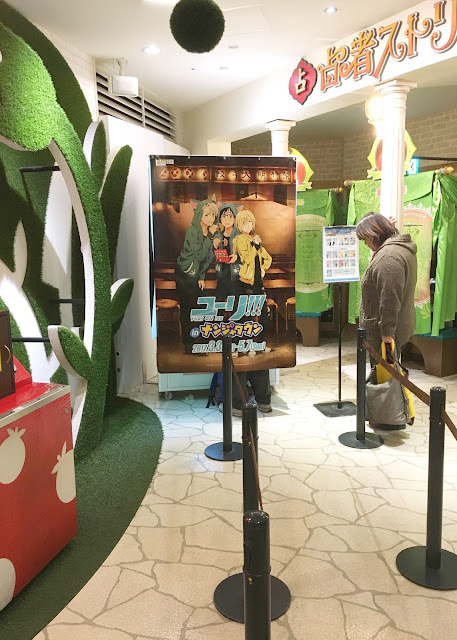 Namja Town is a small theme park located in Sunshine City, one floor below J-World. 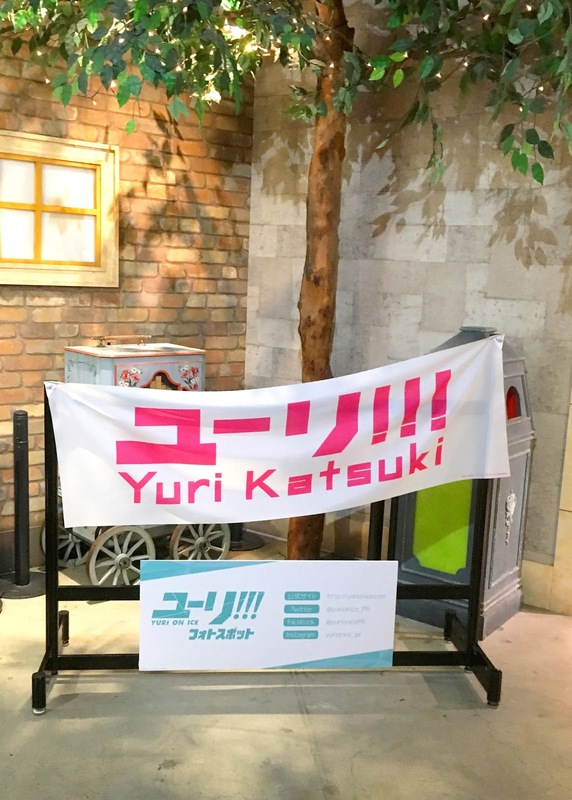 It is owned by the same company the owns J-World, but it is not an anime/manga based theme park. It's most famous characteristic is pathway of about 15 different gyoza shops, all serving different kinds of gyoza. If you are a gyoza fan(I am) this is the place for you. There tends to always be at least one anime collab running though, so be sure to check the Japanese website if this place interests you! 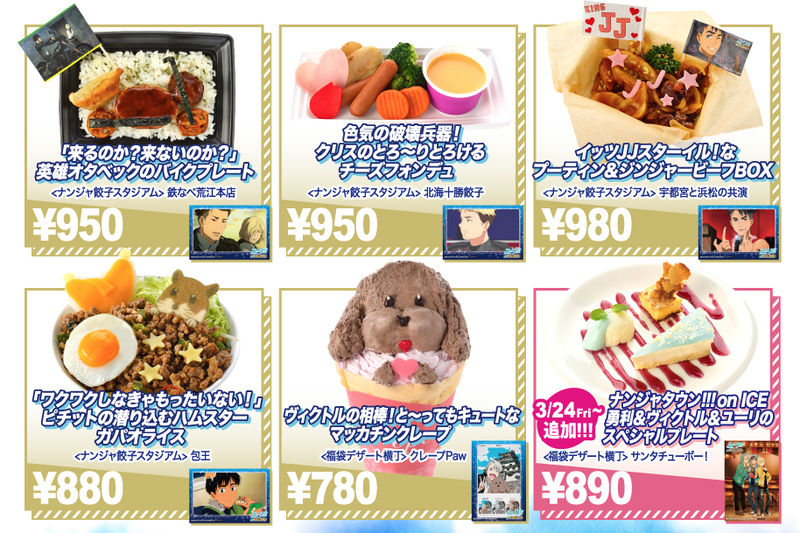 So how the collab menu items work is that each of the different food stalls sells one of the collab food items. In order to eat off this menu, the first thing you have to do is find out which food stall is selling which collab food item. 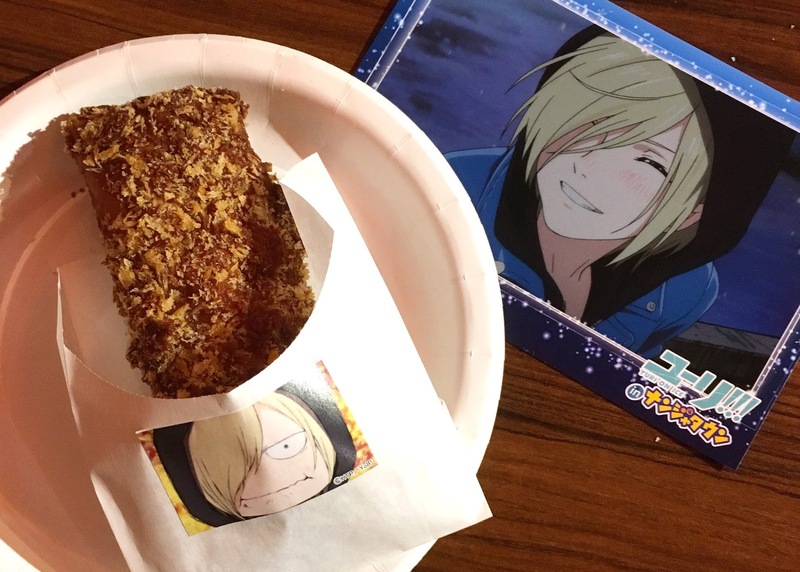 I really really want to try all this Yurio food. 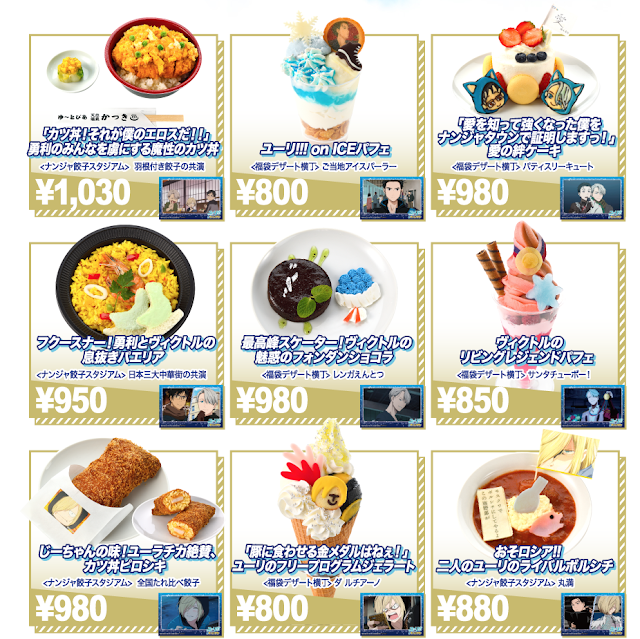 All of the food items come with a postcard, and luckily for everyone, the postcard is predetermined based on what food item you get. For this trip, I ate two food items and one dessert. So as over Pichit as I am, I could not stop myself from getting this dish simply because it looked so tasty. When I got it, I was a little surpised because this dish cost 880 yen, but the amount of food you received was about the size of my fist. That's the bowl next to a normal sized postcard for reference. Since the bowl of food was small, it was even more of a disappointment when tasted super amazing. It was some kind of meat mixed with peppers with cheese on it and a fried quail egg over rice. It was super amazingly delicious, and I really wish I could have eaten more because it certainly was not enough to fill me. So this tasted good, but anything deep fried will taste amazing so it is not too surprising. I was kind of expecting it to be a little more filled, but small portions seems to be a theme at this place. 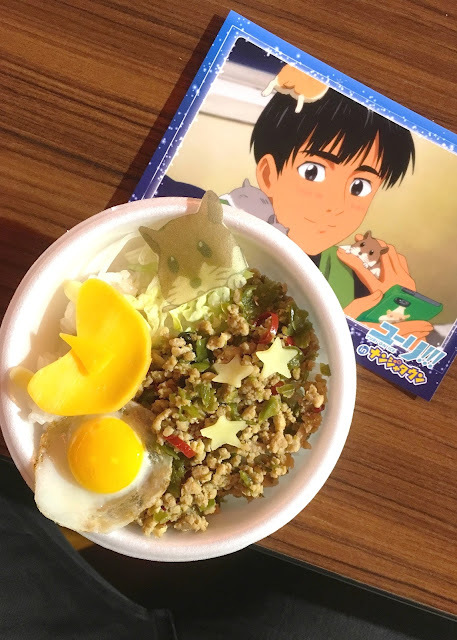 I really wanted to try this because it is actually a food featured in the show and I am weak for that kind of thing. My favorite part about this is that the wrapper was just a normal wrapped with a Yurio sticker on the outside. I just find it so funny because it looks so cheap and I love it. 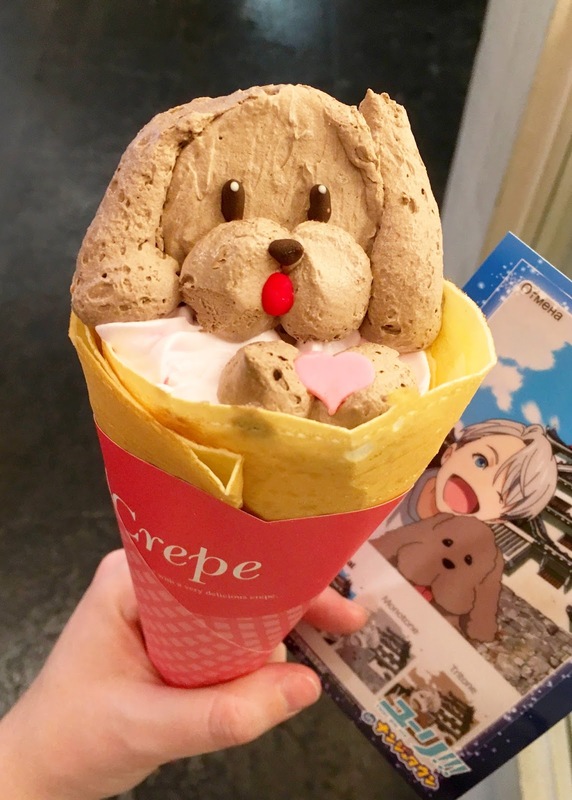 So this was another food item that I had been dying to try because it so strongly resembled the character from the show it was based on. This crepe was really good and incially I was disappointed to find out that it was just a brownie with 3 different kind of whipped cream inside, but that was a really good brownie and I love whipped cream. Whipped cream is like my favorite thing ever, and good brownies are hard to come by in Japan. 10/10, would eat again. There was not really much of an exhibit here. Just a big wall decorated with the collab art, and a weird semi-realistic 2.5D image of Macchan inbeded in it. There was also one lotto game where you could win these huge buttons of the characters, a banner like the one that ballet sensei holds, and a photo booth. This art sure is super duper cute though. I am weak for it. Look at Victor popping that hip. 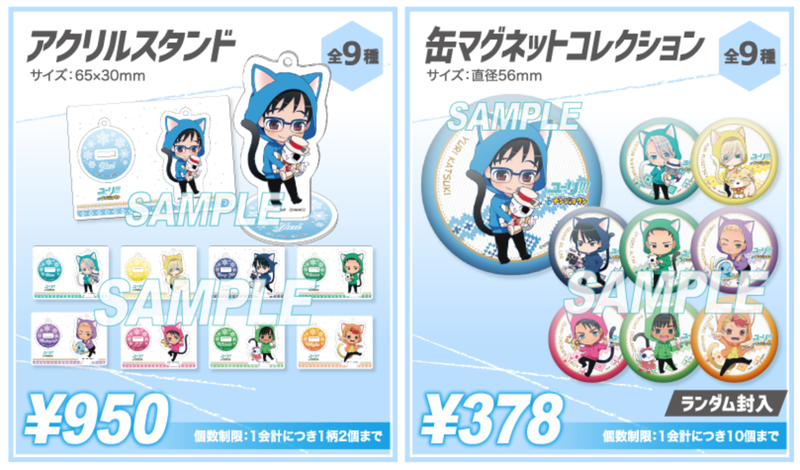 What is nice about this is that while the lotto decides what kind of merch you get, you got to pick character. 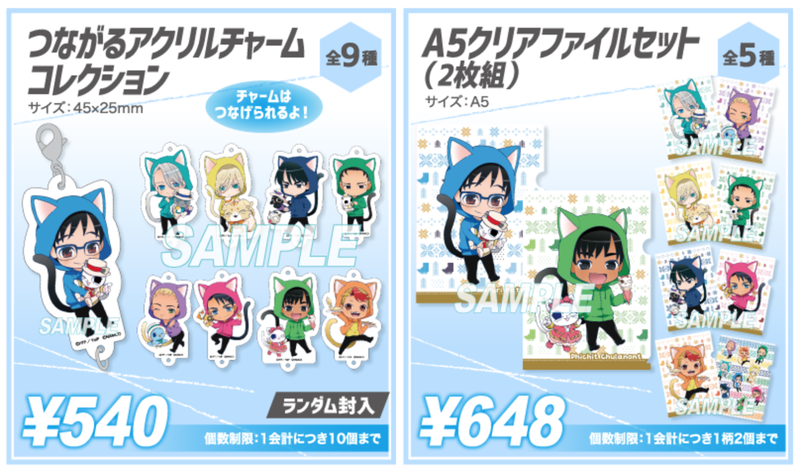 This also means that Victor, Yurio, and Yuri are pretty much sold out of everything. I really liked this because it was in the actual show even though the backdrop for it is kind of weird. They have a few different options for backgrounds. I found it really disappointing that when you selected the characters they did not appear in front of you like they do in some photo booths. Instead, you are stuck posing in front of them. 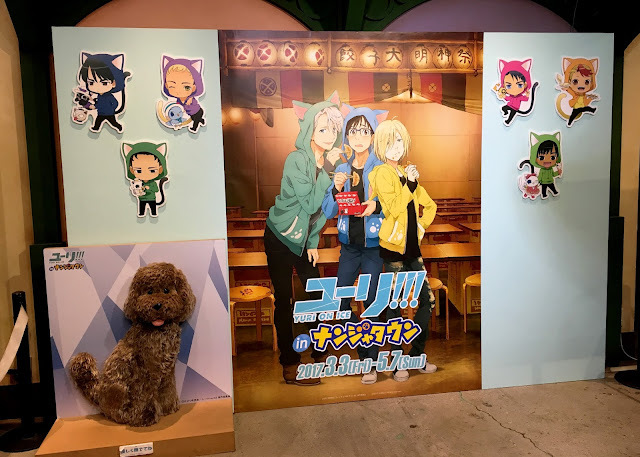 One thing I can really appreciate about this is that this place has a wide variety of merch, collaboration and not, and it is has collab merch that it is not blind. My first trip I only bought some of the blind merch, as is my tradition, but I might buy some of the character spesfic merch on my second trip. Victor's design for this collab is just so cute, I was tempted to buy the pillow for it. The acrylic charms on the left are blind. You can select the character for the standees on the left, but the magnets on the right are blind. These are some pretty cute pillows. These items started near the end of the month of March. New items from the end of March! So if you bought over 2,000 yen of merch in the store, you got a free sticker! I broke my rule and ended up buying three of each blind item to meet that amount. I got two Pichet magnets, as is my luck, but I also ended up with two little Katsuki Yuri's so that's nice. 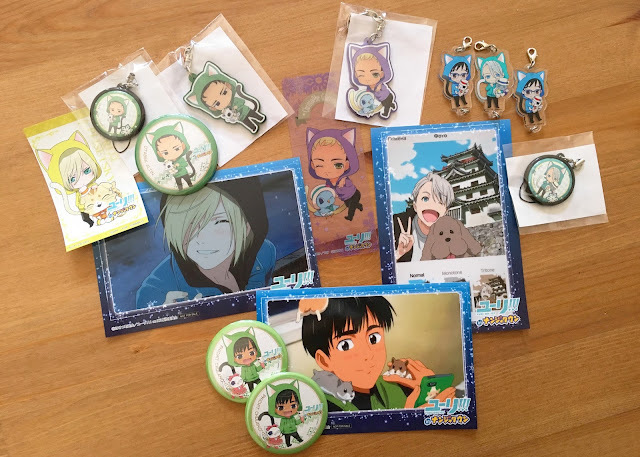 The Otabek and Chris keychains, Otabek and Victor phone straps, and the Chris bookmark are from the gacha game. While the exhibit for this event was not that great and some of the food portions were small, I still want to go back and try more of the food. 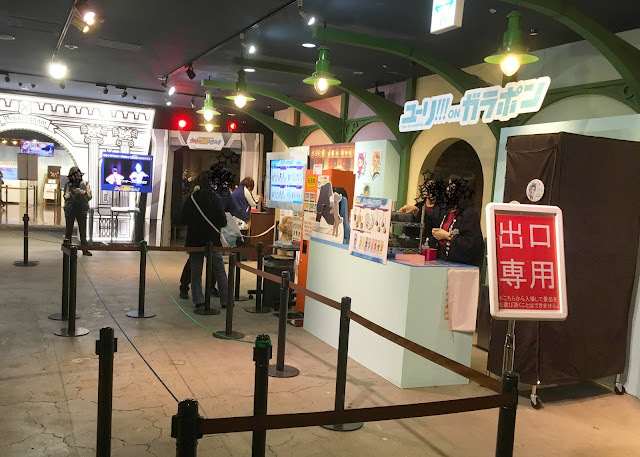 I do not think that this exhibit would be interesting enough to make a special trip to Tokyo for, but if you are in the area or cannot make it to a special lottery reservation cafe, then this is not a bad option. It is also pretty cheap, which I think contributes a lot to it's "not bad" factor. If you go to this, you are primarily paying money to buy food and merch, which is not the most appealing thing to me personally. I would give this collaboration a 6/10.